This past week was one of those weeks. I’m sure you’re familiar with the kind of week that happens now and then when some of life’s other priorities demand time and attention that you much would rather spend gardening. It was one of those. As such, my gardening activities dropped off to a minimum over the last few days. Fortunately, this weekend has provided the opportunity to finally get back into the garden, so I spent some time on odds and ends — literally. 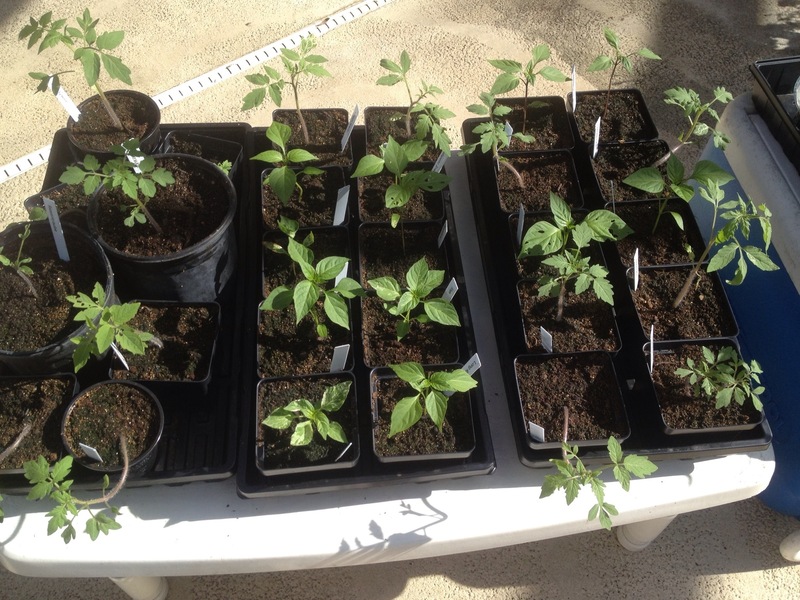 The first wave tomatoes and peppers, detailed here, are doing quite nicely as you can see in the picture below. All of them are looking strong and healthy, with one exception. At the time I transplanted them recently, I noticed that one of the large red cherry tomato plants was nearly severed close to the base of the stem. I do not know how this happened. Because of this, I buried it pretty deeply when I transplanted it, so that the damaged part of the stem was below ground. It lay weakly on the soil at first, but now it is beginning to stand up on its own. I wouldn’t say it’s in the clear yet, but it does look promising. The rest are doing as I would expect at this stage. I’ve been taking them outside the screened enclosure for a few hours a day to help them get accustomed to the full, unfiltered sun. My second wave plants, detailed here, are also coming along nicely. 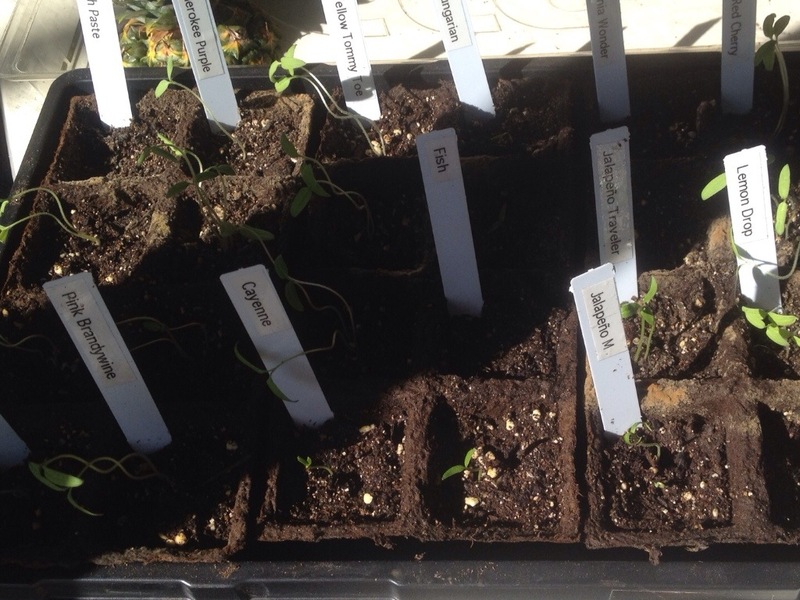 Nearly all of them have sprouted, as you can see below, so it’s about time to start putting them in more direct sunlight. Although the sun looks bright in this picture, the place where they’re sitting is shady most of the day. This picture was taken in the late afternoon, during a period of maybe half an hour a day when the sun shines on them directly. Now, on to the odds and ends, starting with the odds. 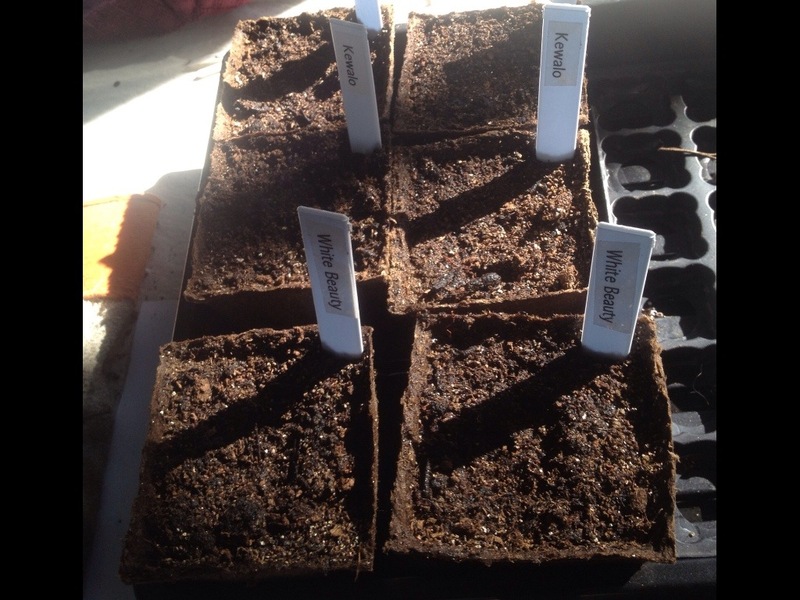 In this week’s mail, I received my last set of tomato seeds (for now, anyway). I only got three varieties this time, but each one is a bit of an oddball. I planted two of each yesterday. Carbon — Heirloom aficionados often rave about the taste of black tomatoes, yet many people have never heard of them and would very likely pass them up if offered. If you expect tomatoes to be red or if you tolerate the occasional well-maybe-okay-I-guess-so-yellow, then a black tomato will look just plain wrong to you. It will be largely red, but will also have dark splotches here and there on the surface and on the inside. To the aficionado, a black tomato represents the kind of rich, complex, subtle combinations of flavor you just can’t find in ordinary reds. By way of analogy, the black tomato is a bottle of red wine from the reserve list, whereas a red tomato is the house red. Grocery store tomatoes are more like a cheap white Zinfandel. The Carbon tomato, as the name suggests, is a black tomato that produces well, yields uniformly round, mid-sized fruits, and often wins taste awards. I have never grown a black tomato before, so I figured I would start with this one. Kewalo — There is nothing odd looking about this tomato, which produces a medium sized, round, red fruit. What is unusual, though, is that it is one of the few open pollinated (i.e., non-hybrid) varieties developed specifically to do well in hot climates. Not only does it tolerate heat, it is resistant to several tomato diseases common to this area. It was developed at the University of Hawaii. I decided to try this one to see how well it does for me in Central Florida. White Beauty — This tomato is probably the most unusual of the three. White tomatoes are fairly rare, and this one even more so. The White Beauty is said to be the whitest of the white tomatoes (which are typically more of an ivory color). White tomatoes are not well known for their taste, and this is no exception. They tend to be high in sugars and low in acid, giving them a sweet taste, quite unlike the taste we generally associate with tomatoes. I’m growing this one more out of curiosity than anything else. 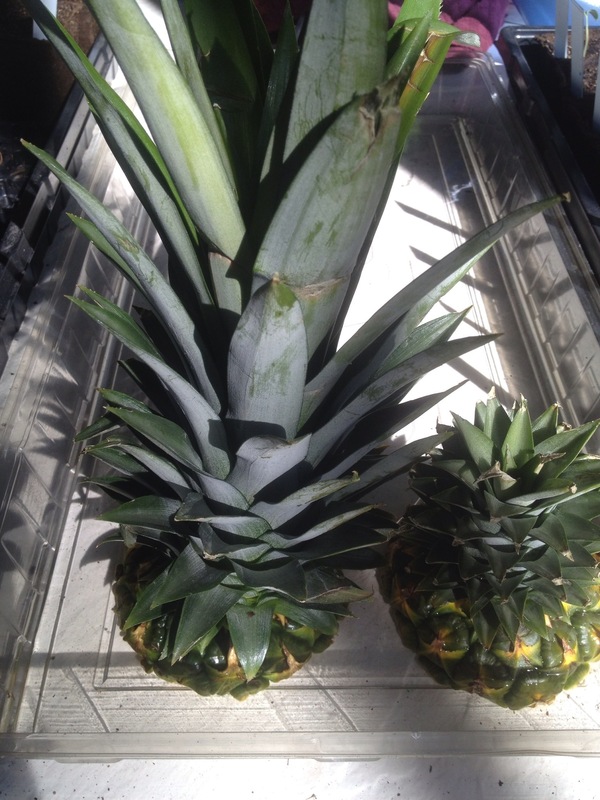 As for the “ends,” I started rooting the top ends of two edible bromeliads, more commonly known as pineapples. There is a vendor at our local farmers market who sells fresh pineapples. He cuts the top off with a knife and then uses a nifty little gadget to core and slice a whole pineapple with just a few twists of his wrist. I bought one yesterday morning and then asked him if I could have the top. He said, “Sure! How many would you like?” So, I took two. From what I have read, it’s really easy to take a fresh top and turn it into a new plant. You place it in a pan of water about half way up to the bottom of the leaves, and you leave it there for three days. After that (whether you see roots or not) you plant it in good soil. It does the rest. It takes anywhere from 24 to 36 months to produce another pineapple, but in the meantime, you have a nice tropical plant. The picture below shows these two sitting in a tray lid with about an inch of water. Perhaps I should name them Mutt and Jeff. Better yet, maybe I’ll call them Odd and End. I’ve never seen a large black tomato, but just recently bought a box of cherry tomatoes that were a mix of colors, including black; it was tasty, but sure looked strange amidst the red and yellows. The largest I’ve ever seen have been of the medium variety. The appearance is a bit odd at first, but the taste is good. I’m looking forward to growing these! Great info on the tomato varieties! will be bookmarking this post for future reference! Great! I’ll be sure to report back on how they all do. It’s going to be a fun fall garden!! Nice! Looking forward to tasting those black tomatoes. Is the Carbon tomato anything like the Russian tomato? For the life of me, I can’t remember if I planted Russian tomatoes or bought some somewhere. Anyway, it was almost black. I don’t remember the taste but I do remember the color. Very nice blog BTW! How interesting that they come from Russia or that area. Thank you for sharing.